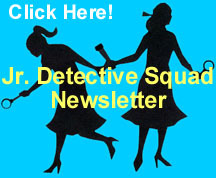 We have discontinued our JR Detective Squad for kids - if you wish to join our regular Nancy Drew Sleuths fan group, please visit our NDS membership page to do so. Current JR. Detective Squad members, access our October 2018 newsletter to see details about your JR membership merging into our NDS membership and print out your new card! This JR Detective section will be available only for a few more months as we merge into a different site. For Nancy Drew computer game information, tips, and hints, please visit the message boards at Her Interactive! 1. Your local library - it's a fabulous place to visit with shelves of fun and adventure awaiting you! Nancy Drew loved to research her mysterious cases at the local library in River Heights. 2. Your school library - if your school library doesn't have Nancy Drew books, ask for them to start carrying them. 3. Used book stores - these are great places to find all kinds of Nancy Drew and other fun books. Many at half or more off the cover prices. 4. Put them on your want list - strike up an agreement with your parents or guardians - with every good report card (etc. ), you get a Nancy Drew book! Or better yet, get motivated and put a Nancy Drew-style little elbow grease into the mix - arrange to get an allowance for things you do around the house or for your family and save up for your favorite Nancy Drew books on that next trip to the bookstore. 5. Start a lending library in your neighborhood and trade books with your friends and neighbors. It's a great way to sample lots of fun books, including Nancy Drew! Copyright © 2003-2015 by Nancy Drew Sleuths. All Rights Reserved. Nancy Drew® and the Hardy Boys® are registered trademarks of Simon & Schuster, Inc. All rights reserved. This site is neither affiliated with nor endorsed by Simon & Schuster, Inc. Any of Simon & Schuster's Copyright material appearing on this site complies with fair or acceptable use principles established in U.S. and International copyright law for the purpose of review, study, criticism, or news reporting. Her Interactive Computer Game images copyright Her Interactive. Graphic Novel images, Copyright Papercutz. Classic Nancy Drew images, copyright Grosset & Dunlap/Penguin Putnam. Nancy Drew movie images, copyright Warner Brothers.